Its been a while since I’ve made my last dessert and figured it was time for me to put the kitchen to use and test a new recipe once more. With cherries in season and on sale, I thought what better than to pick up a bag of fresh cherries and see what kind of recipe I could find to use them with. The downfall to fresh cherries is picking out the seeds. However, this didn’t take as much time as you would think and the end product is so much better than what you would get from sugared up canned, preserved cherries from the baking aisle. After returning home from the store with the cherries in hand, I started looking for recipes that I could use. Cherry pie sounded too heavy, and while cherry cheesecake sounded amazing, considering I had a hubby waiting to try whatever came out of the oven, it would have been too time-consuming and taken too long to be ready to dig into. 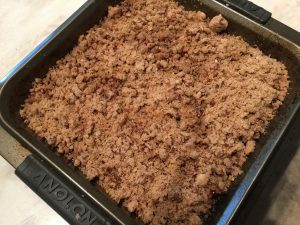 It didn’t take long before stumbling upon a recipe for a cherry crumble. It called for fresh, pitted cherries, it seemed simple enough to make, and I had all of the other ingredients on hand. Again, the most difficult part was getting the seeds out of the cherries, but after that, it all came together nicely. For the most part, I followed this recipe exactly as is. The only thing that I improvised was that I made it in a 9″x9″ baking pan instead of individual baking ramekins. It turned out just fine in the baking pan, but I did notice that I only had to bake it for 20 minutes instead of the 20-25 since it wasn’t as deep. Oven baking times do vary, though. The end result? A refreshing cherry crumble that isn’t overly sweet. This recipe is perfect for a warm summer night where you are in the mood for dessert, but don’t want something heavy or super sugary. There is plenty for serving 4-6 people a decent sized portion, and fresh out of the oven with ice cream melting over the top makes it even better. Will I make this recipe again? Definitely. It is both refreshing and comforting in the way of desserts, and a little bit goes a long way in satisfying a sweet tooth. Heat oven to 375° F. Lightly spray four 7-to 8-ounce ramekins or five to six 5- or 6-ounce ramekins or custard cups with baking spray or lightly butter the bottoms and sides. 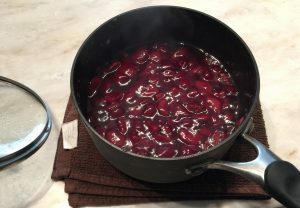 In a medium saucepan, combine the pitted cherries, water, 3/4 cup sugar, and 2 1/2 tablespoons of cornstarch. Stir to blend and put the pan over medium heat. Bring to a simmer; reduce heat and simmer, uncovered, for 10 minutes, stirring frequently. Divide cherry mixture among 4 7- or 8-ounce ramekins (or 5 to 6 smaller ramekins or custard cups).